Buying used – Look over accident history, the number of previous owners, past mechanical problems, and maintenance history. Try to find cars that are Certified Pre-Owned (CPO). Before you buy, you should ensure you have at least 30 days to make sure the car is in good condition. Buying new – Do some research online to figure out which car is the best match for you. Check out the manufacturers’ websites and read user reviews. You don’t want to walk into a dealership without knowing anything about your future car. Do your research – Do everything you can to figure out what incentives, rebates, and other deals you can get on the car you want. Call local dealers and compare quotes online. Having a sense of the right price will ensure you don't get bamboozled. Curb your enthusiasm – Show little to no emotion when you test drive. Make sure all the car’s essential features match what you want, and give yourself an hour and a half for the test drive so the dealer can show you everything. Don’t allow the dealer to pressure you into buying right after the test drive. Bargaining – Beware of sleazy car salesmen scams. Before you go to the dealership, see what the average price others are paying in the area for the same car and contact the lowest bidder. Try to opt for incentives and rebates that are just for recent grads. payment should not exceed 12-15% of your after-tax income. Use this calculator to figure out how much car you can afford. Narrow down the field by examining your needs (good gas mileage, 4W drive) versus your wants (DVD player, captain's seats). 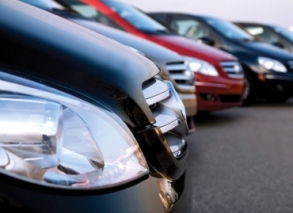 From there, you can think more practically about whether to opt for a new or used vehicle. If you go the used route, there are a number of places you can look: used car dealerships, new car dealerships, websites like Carmax and ConsumerGuide, and print and online classifieds. In addition to accident history, you should research the number of previous owners, past mechanical problems, maintenance history, and if it has ever failed inspection. Run a vehicle history report using the Vehicle Identification Number (VIN), which can be found on a previous driver’s insurance card, the registration, the VIN plate on the driver’s side dashboard and the certificate label on the driver’s door jamb. Check out the Kelly Blue Book Used Car Guide for appropriate prices, but note that the estimates are based on a car in good condition that has put on about 12,000 miles per year. Try to look for cars that are Certified Pre-Owned (CPO), which means they were subject to an inspection more rigorous than an elementary school lice exam and are usually covered by a warranty from the manufacturer. CPO cars cost a bit more, but the added warranty and sanity may be worth it. If you opt for new wheels, you need to do your research before heading to the lot. You don’t want to be sold a car by a slimy salesman you’ve known for two hours; instead, you should purchase a vehicle you’ve already picked out in the comfort of your own home. As a starting point, check out this list of good cars for recent grads. Go to manufacturer’s websites to check out cars and options. Once settling on a few, check out pricing at Autoweb, Car.com, or ConsumerGuide, then read reviews at Car and Driver and Edmunds. Keep in mind that one car may be cheaper to buy but more expensive to own. Use this cost to own calculator to get an idea of how much the car will cost over the next few years when you consider insurance, maintenance, fuel, and depreciation. Just as you wouldn’t marry someone without dating them first, you should never buy a car without driving it. Don’t just swagger into a dealership and ask to go on a test drive. Look up local dealers and call ahead of time to schedule an appointment. Tell them the exact car you’re interested in and that you won’t accept driving anything else. Make sure all the “hard” features (e.g., engine, brakes, transmission) match what you want; cosmetics don’t matter at this point. Be wary of driving a car with more features, as it may skew your opinion or push you to spend more than you can. Drive in both stop and go traffic and on the freeway, take turns tightly, drive over bumps, and test the brakes in an empty parking lot. Allow about an hour and a half for each test drive so there’s time for the salesman to demonstrate the features and for you to drive the car and to check out the dealership. Afterward, write down any notes that would be helpful on the sticker (some dealers will give you a printout). After you’ve recorded everything, you should get out of there quicker than if you walked in on your parents. Since the salesman will get bitched out by the manager if they don’t get you into the bargaining cubicle, they will do everything in their power to get you to stay…including throwing out something known as a “low ball.” They have absolutely no intention of selling it at this price, it’s just a tactic to get you back after shopping around. On the way out, grab a business card and any pamphlets on the model you drove. Try to schedule all the test drives in one day so that we can notice the minor differences between cars. Once you’ve honed in on “the one,” check out Gradspot’s article on leasing vs. buying. Then look up incentives and rebates to see specials in your area and try to find cars that are just for recent grads. You’re often offered either a cash rebate or low-interest finance options. Before taking the cash, use this rebate vs. interest tool to figure out which is the better deal. You can either call/email local dealers or get multiple quotes at once from those in your area. Figure out what’s a fair price by using this True Market Value calculator, which shows the average amount others are paying in your region for the same car with the same features. Take the lowest bidder and call around to see if any others will meet the price. Once you get a good offer, ask the dealer to fax you a worksheet with all prices, taxes, and fees. If you’ve got old wheels we want to trade in for money towards the new ride, read this article to get the most bang for your bucket. Let’s get ready to rummmmbbllle! It’s finally time for some in-person wheeling and dealing. Car salesmen are often as sleazy as you'd expect, so read these dealer scams before setting foot in the arena. You should know your credit report so they can’t gyp you on incentives and interest rates. Remember that even the scuzziest salesmen are human and get tired—go in 90 minutes before closing and they’ll be less likely to haggle. Many also have quotas to meet, so visiting on a rainy day or near the end of the month may boost your negotiating power. Don’t succumb to flattery or pressure; remember that you are in the driver’s seat…for both the negotiation and thereafter. Be wary of extras—the price can add up quickly. Don’t allow them to run a credit check using your license or social security number before settling on a price. Beware of salespeople trying to charge extra for ordering the car from the factory or locating at a different dealership. When you do get to financing, they’ll probably try to get you to go through their finance department. The low Annual Percentage Rates (APR) they advertise on TV are often only for those with perfect credit or first-time buyers. Since recent grads often fit that bill, you may be able to get a good plan through the dealership. However, most people obtain lower interest rates through banks. Check Eloan and Lending Tree or get loan rates from multiple area banks on Bankrate. Once the papers are drawn up, be sure to read everything more carefully than IKEA instructions before signing. Look for errors or changes and don’t accept anything you didn’t request.